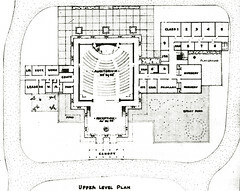 An early version of the Upper Level Plan for the Ethical Society. This drawing was published in a fundraising brochure distributed by the Ethical Society. The plan is fairly accurate with respect to the final configuration. The portions of the plan that were alterred in the final version include the shape of the stage, the elimination of stairs at each side of the Reception Area, the elimination of the canopy at the main entry, and the modification in the size and configuration of the spray pond. This plan corresponds to the design illustrated in the design model.